ElmoJuanara.com - Muda dan Berbahaya: Essay Bahasa Inggris - Student Action. Is It Necessary? Essay Bahasa Inggris - Student Action. Is It Necessary? Students Action. Is It Necessary? Nowdays there are many issue in our country. Problems come and coming again. Beside, people still do not hear the right issue and their eyes still close from the right information. So why writer brave to say that student action is the good step? Because the media is not already trusted, and if the media not trusted anymore, who anyone should be trusted? Again writer said, student action is the answer. Because while a students take action and speak up, they speak with neutral, not stand in one side, but neutral. Not like media, that speak issue just for their benefit. If there a messanger that speak issue just for beneficially, then what different with animal. As we know, animal want to move if we give they food, if we cannot give they food, they don’t want to move. In other words, animal just want to move if they have a benefit. So student action is the answer from all. There are many reasons why people dislike and ignore the student action. Start with no result, just waste energy, and many more. And that’s why a big part of people really dislike and ignore the student action. Although there’s many and good reason why student have to take action. As we can see, if there are student take action on the street, exactly people will dislike them. They say it cannot effect to changing. It just nonsense action. And they say too it just waste energy, how not? They just speak up in the street, not much of people attract of this action, they just ignore this. Moreover, student action just making traffic jam. How sad if they really passion with action, but the audience like close their ears and reject it. That’s all the problems that student action ignore in public, whereas there more reasons why student must take action. The first reason is if the student do not speak up, then who? As we know, one of responsibility as student is to sounding the issue to public in truth issue. As student, we must speak up in neutral, not stand in one side. If we talk about student, student is the high level education in of country, no more education that higher except student. Because after college, there are no more education level, so college is the higest level of education in of country. So that, if the college fill with the student that received higest educational, so student must have capability to become observer of country. As student that received highest educational level must have use their capability for observer problems in their country, because in future they will exchange older generation. With student action, student will study how to observer problems and issue and they will forced to think how to solve problem. With this condition, besides student speak up and sounding the issue to public, they learn to become leader in future. Back to the topic, whether it can if children or old man speak up issue and stand for defend the right ? if the higest educational people do not speak up (read : student), then who? The second reasons why student have to action because adult already really really busy with their activity and forgot about issue in around. Nowdays, when the most part of people just finding material in their mind, anything that not relate with their personalty, they will ignore, even reject. When world change become material, very little people that still care about their country. Very rare adult that still sensitive about issue around. Maybe this is a strategy gouverment to switch attention public in issue. When their attention is switch, then gouverment can free to play issue, and public just can silent, there not strength to against the gouverment, because they self too not care about issue. And that’s why, this is a time for student to take a role for sounding to public the right issue. When the adult do not take care and sensitive about the issue around, when the children is still young, when the older generation cannot be hoping anymore, again, this is the time, the time for student to down to street and shout the truth. 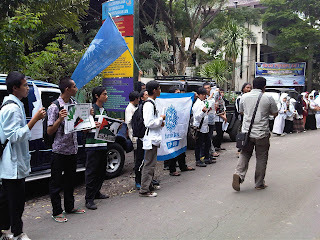 And the last reasons to support this argument, student as agent of change have to be pioneer to open civilization eyes. Agent of change is the label that always stick on every student. Looking for the position student as a higest level educational person, student is very expecting to become pioneer of leader in future. Before become leader in future, student have to through many process, and one of process to become agent of change. What is agent of change? From the name, agent of change is a person or organization that have vision to change a condition from dark situation to light situation. With there are student that become agent of change, then probability to change our condition opened. As we know, student that have higest educational level and have more strength and energy and the passionate of spirit become the good chance to change to making condition better. Is unfortunate if the great potential like this lost and gone, how pathetic if the great potential like this abused. With this arguments, writer say with clearly, that the negative people are saying that student action is useless, waste energy, making traffic jam, and etc, is big false. Maybe the people are saying like that, they do not understand what benefit and meaning of student action. Maybe they never had a basic knowledge about issue management, maybe they not interest with sosial life, and concerned about their self, so this is the fact when people did not care about each other, even about their home (read : country). Whereas if we read and see the arguments before with carefully, we can found the deep meaning of action. If action did not have a benefit, why possible the highest level educational person want to tired and exhausted shouting the issues that not have benefit and advantage. I tell you know, if you see student that action on the street and ignore even reject them, I will understand. But if you still ignore and not care about issue in our country, I will never understand, from which the earth you come from? From the paragraphs above we can conclude, that student action is the one of way to show the right issue in public. With brave and faith in right place, student action will open public eyes with the real condition in our country. Because student action is the one of way to sounding the truth condition to public. Although there are many people that dislike and igrone this action. Besides, student as agent of change, will be pioneer to be changing. In other condition, adult and older generation cannot be hoping anymore, so student is the key to open the new future. Reminded of the words from someone, if the young generation is broken and damage, then the future of country will be the same. Last statement, it doesn’t matter what people say about our action, it doesn’t matter to take hundred years to open eyes public, will still keep moving forward to show the truth for be better future.